2) You have a big error in your calculation of 20452.053 design factor that you are not addressing in any of your replies. I haven't seen a reply acknowledging your error. Now alter frequency to 1.262GHz, which is very close to the 1/2 subharmonic of 2.45GHz. Frequency: 1.262GHz which is very close to the 1/2 subharmonic of 2.45GHz. When solving a physical problem I like to display values corresponding to physically valid cases. I would not display non-physical values. But again that is a matter of choice. So there is no need to argue about it any further, now that I understand that you are displaying non-physical values. I don't understand why you are displaying that non-physical case. 1) The Df alters with the Rf frequency and cavity configuration. 2) The value of the cavity Df effects the generated Thrust. T = 2 Df Po Q / c. Therefore Rf frequency effects Thrust. 3) There is a Rf frequency for every cavity configuration that will generate an infinite Df. 4) Rf frequencies below that optimal frequency generate negative Dfs. 5) Rf frequencies above that optimal frequency generate positive Dfs. 6) All tuned / resonant circuits have a peak resonate frequency. 7) High Q tuned / resonant circuits have a very sharp energy stored versus frequency curve. 1) The plots for Df versus frequency sure like what I would expect from a tuned circuit that has a very high Q being subjected to a spectrum sweep. 1) Shawyer appears to operate his Flight Thruster at an Rf input frequency of 3x the optimal cavity Df frequency. 2) I don't think that is coincidence. The Design Factor is an approximate equation that Shawyer presented but that he did not (to my knowledge) mathematically formally derived. It has been criticized by a number of physicists and engineers. Shawyer's Design Factor mathematical formula contains a singularity for finite values of the geometrical dimensions and finite values of frequency. The infinite values at the singularity and the negative values are obviously non-physical: they correspond to values that cannot take place in our physical world. That may be misinterpreted as if it would be physically possible for this to occur, and that Shawyer's approximation is an accurate model for reality over the whole range of input variables, I would instead write that there is a finite frequency at which Shawyer's expression blows up due to a singularity in Shawyer's approximaton. As an analogy, McCulloch's expression blows up for the small diameter approaching zero. I brought this up to the attention of McCulloch and McCulloch readily admits that this is due to an approximation he made in his 1-D formula. Obviously, a pointy cone would not behave the way that McCulloch's formula would predict: that limit is a non-physical situation outside the approximation limits of McCulloch. Similarly it maybe that Shawyer's expression is an engineering approximation to certain unknown ranges of dimensions and frequencies. Clearly, very large values of Shawyer's Design Factor much exceeding 1/2 and any negative values are non-physical (as brought up by Todd, separately). It may also very well be that the singularity in Shawyer's Design Factor is due to the cut-off condition. If that is the case, how accurate it is for engineering purposes and for what range of input values, remains to be assessed. Hi, Yesterday i received and tested a magnetron from a microwave oven. Today i received the cooper and in a couple of hours i will expect to finish the frustum, will post the results in my website, where i started to post the progress of my work live: http://www.masinaelectrica.com/emdrive-independent-test/. If i do not encounter big problems i should test the drive in 3-4 hours. From the thermal and A/m plots from EW, most of the resonance is happening at the big end. I would not put the magnetron in that space because the input there will probably perturb the waves. Shawyer put the input near the small end. I would put it "at" the small end, depending on wave polarization. The walls should do most of the reflecting, not the small end. The Design Factor is an approximate equation that Shawyer presented but that he never mathematically formally derived. It has been criticized by a large number of physicists and engineers. I know infinite values are impossible. Likewise negative Dfs. That was not the point. The point is the Df equation, applied to a variable frequency, shows there is an ideal frequency that will generate the best cavity Df. Driving the cavity with some chosen frequency, like 2.45GHZ will probably NOT make anything happen. Like trying to drive a tuned LC circuit with a frequency far away from it's resonate frequency. Waste of time. Likewise driving the cavity with the calculated best Df frequency will probably do the same thing. No thrust in the real world. What the exercise shows is that the Rf generator driving the cavity should be operating 2x or 3x the best Df cavity frequency and that Rf frequency generating system must be able to vary the driving frequency so to search for the best frequency in the real world. 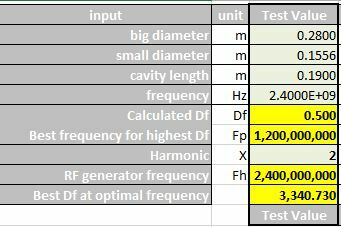 The spreadsheet give me a starting place and an understand the cavity best Df frequency should be 1/2 or 1/3 the applied Rf frequency. To me as an engineer starting a replication of the Flight Thruster and associated variable Rf generation system, it is very new and valuable information. This is all related to real world engineering (building actual hardware) to give the best chance of generating thrust. To assisting theory development, well it may not be of much value. @aero had correspondence with Shawyer asking for the dimension of the small diameter, to my recollection Shawyer cryptically answered "small base diameter chosen on the basis of the cut-off frequency" (hence still unknown how close to the cutoff wavelength was Shawyer's chosen small base diameter). @aero had correspondence with Shawyer asking for the dimension of the small diameter, to my knowledge Shawyer cryptically answered "small base diameter chosen on the basis of the cut-off frequency" (hence still unknown how close to the cutoff wavelength was the small base diameter. 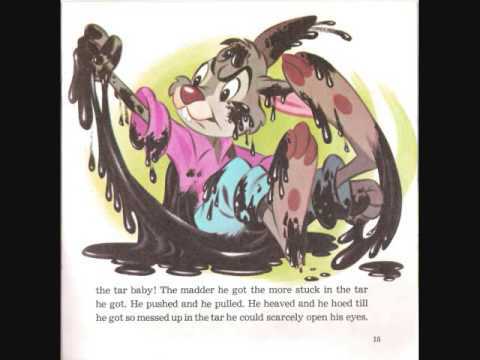 Personally, more than an "archaeologist" I feel like somebody dealing with the tar-baby in Uncle Remus: The more that Br'er Rabbit fights the Tar-Baby, the more entangled he becomes. As noted @aero (hat tip to him) already made a valiant effort to obtain the geometrical data from Shawyer. It has already been pointed out that people in present e-mail communication with Shawyer as well as others doing do-it-yourself can similarly attempt to obtain such data directly from him, if so interested. Applying that cavity data to my SS I get a small diameter of 155.6mm (Df at 2.4GHZ = 0.500) to give a best cavity Df at 1.2GHz and a 2x harmonic at 2.4GHz Rf input frequency. What did the other guys get at small end = 151.3mm diameter? Would be interested to know. Skip that. My diameter of .1556 or 0.0778 is just about spot on the vertical blue dashed line and hits the 2.4GHz as operating at 2x the best Df frequency. So you've become entangled with Dr. White's Q drive. There is a name for that. Haha, thanks for this analogy. So let's hope all mysteries will be solved before anyone gets thrown into the Briar Patch... (pun so very much intended ). 2) True, but as far as I know neither Warp nor Impulse engines seem to work there, so I am not sure if that's the place where you'd like to be. Having dealt with such technical subjects as Br'er Rabbit, the Tar-Baby, the Briar Patch, and the Ba'ku planet, we embark now into the more mundane world of Shawyer's experimental data. Please observe the attached image of Shawyer's Demonstrator Engine Data. Please notice the huge difference between the onset of the Power signal trace (vs. time) and the Down and Up thrust force signals vs. time. Note the time (from onset to reaching the first plateau or knee of the curve) is about ~20 sec. Recall that for NASA Eagleworks tests this delay is ~2 sec (about 10 times less). QUESTION 1: What is responsible for the huge time delay in Shaywer's force signal traces? For NASA Eagleworks this delay represents about ~4*10^9 electromagnetic wave cycles. For Shawyer this represents ~33*10^9 cycles. Clearly, this huge number of cycles has nothing to do with the Quantum Vacuum, or the speed of light, or the time required for a resonant cavity to reach steady state in standing waves. Is this time delay (20 sec) due to a time delay associated with a Q-multiplier effect ? Is the time delay mainly due to the phase shift settling with time ? (due to Shawyer working with a Q multiplier setup having a Q=X times multiplier with feedback, having a phase shift narrow in frequency). (hat tip to @Notsosureofit for the explanatory hint, any misinterpretation of which is mine). QUESTION 2: What is responsible for the time delay in Shaywer's force signal traces after the power is turned off? Note: quotes used to call attention to this message in case they have quotes linked to e-mail message forum notifications. The Demonstrator EM Drive has a stepper motor outside the small end of the cavity. It physically adjust a cavity parameter (maybe length), via the gears and stepper motor, to obtain internal resonance with the applied Rf frequency. This takes time. Shawyer has already explained why there was movement after the power was removed. I really don't appreciate you quoting me and others with nothing but "....."
It seems to have the feed near the big diameter end.